Your body generates electricity. Messages are delivered to and from your brain via electricity by your muscles and your nerves. Your nerves use electricity to help your brain understand your surroundings. Your nerves use electricity to move your body and activate your muscles. If you have sustained a serious injury, or if you are battling a certain disease, these can have a direct impact on the way your nervous system and your muscles interpret or transmit electrical signals. A malfunction in this electrical system can result in you feeling pain, weakness, or numbness.If you are currently dealing with pain in your back, in your hands, in your neck, or in different extremities, you may benefit from an electrodiagnostic test. These tests are performed under the supervision of a medical professional, most commonly a neurologist or psychiatrist. The test does not take a long time, usually around 60 minutes. However, the results you receive from this type of test can make the difference in having unexplained pain and understanding the root cause of your pain. During a EMG test, electrical activity in your muscles are measured. The purpose of the test is to understand the way the nerves are in your arms and legs are functioning. When your nerves and muscles are functioning properly, and the muscles are at rest, there should be electrical silence. It is understandable if you feel nervous about this test, but the truth is that it is not a painful procedure. To start the test, the doctor will insert the needles into the muscles that are being examined. When the needles are inserted, there might be a mild pinch that is usually associated with an injection. But that’s it. Next, your doctor will ask you to relax a muscle and then flex it slightly. As you are doing this, the doctor is looking at a monitor that broadcasts electrical signals. In addition to a visual display, you will hear an audio representation of the electrical signals that pass through your body as your muscles move. Once the procedure is done, the doctor is going to take out the needles. You might be a little sore for a couple of days, but that is going to disappear. There are no long-term negative side effects. Before the procedure, the medical professional performing the procedure will ask you common questions about your health to make sure that the procedure does not put you at unnecessary risk. He’ll also ask you to avoid using lotions and wearing jewelry in the area that is being tested. The nice thing about a EMG is that you get the results immediately. 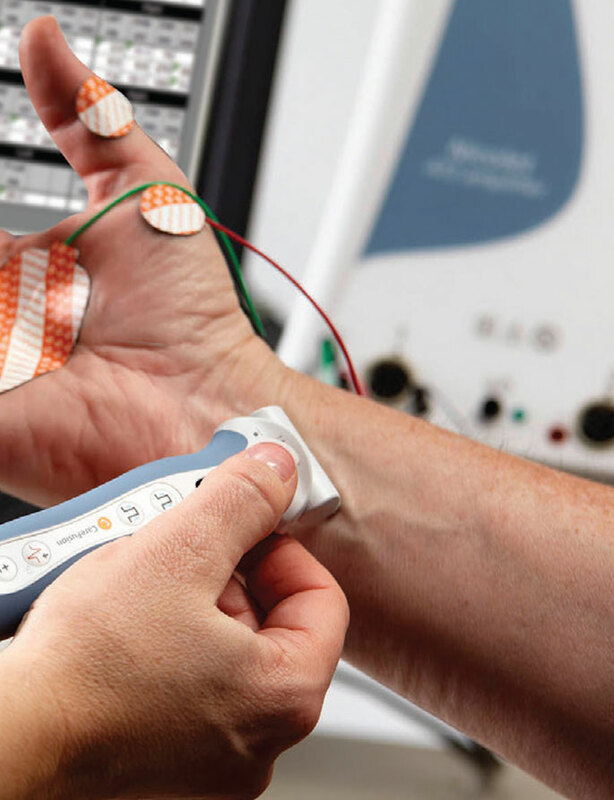 Nerve condition studies are often done in conjunction with an EMG. Their goal is to examine the functionality of your nerves. During this procedure, the doctor will attach electrodes to your skin along the nerves pathway that is being examined. The doctor will use an electrical current to stimulate the nerve. As the electricity travels along your nerves, the doctor is measuring how fast it is traveling. If your nervous system is working an optimal condition, electricity should be traveling at around 120 mph. However, if there is damage to your nervous system, the speed decreases drastically. What’s nice about this test is that a doctor can use it not only to determine if there is nerve damage but to determine exactly where the nerve damage is located. The reason why this is so beneficial is because you may feel pain in one part of your body, but the location of the nerve damage is completely different. You should not feel uncomfortable about taking this test. Most people feel no discomfort during the procedure. The most they feel is a small jolt that is comparable to what you feel when you run your feet across the carpet and touch a metal doorknob. Electrodiagnostic testing does not cure pain in itself. What it does do is allow us to identify the source of the pain, the extent of the damage, and the extent to which certain treatments are helping. If you have been dealing with chronic nerve pain for some time, you know firsthand how frustrating it is to go to the doctor and not have them know why you are hurting. This test takes some of the guesswork out of the equation and helps to pinpoint the damaged area, thereby allowing the doctors to create an effective pain management treatment. Our goal is to use tests like these to provide you with a comprehensive pain management treatment. We want to leave you with a long-term and a short-term treatment plan with the goal of getting you back to living your life the way you want as quickly as possible. To that end, we are keenly interested in listening to you as you tell us about your experience with pain. After listening to you, we will work with you to create an individualized treatment program. We understand that the pain that each of our patients experiences is different, and so our goal is to create a pain management system that caters to their specific needs. We understand that you have been dealing with serious pain for a long time. We will never doubt or question the pain that you feel. We understand that all pain is real, and we want to help you manage and eliminate your pain. The pain management process can be challenging, and it can require time and patience. We guarantee that we will never give up on you as you fight to live a pain-free life. Contact us today, and let us show you firsthand why our pain management strategies are so effective.